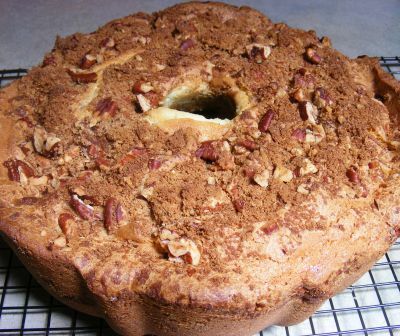 The fifth recipe in the Cakes section of the Modern Baker Challenge is a delicious and simple sour cream coffee cake. What makes this cake unique is the addition of sour cream to what is essentially a pound cake batter. But what makes it amazing is the cinnamon-sugar-nut filling! 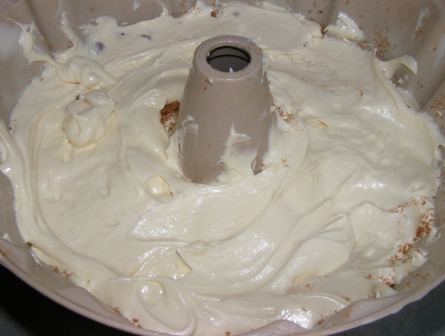 After mixing the batter, I spread half of it in a bundt pan. 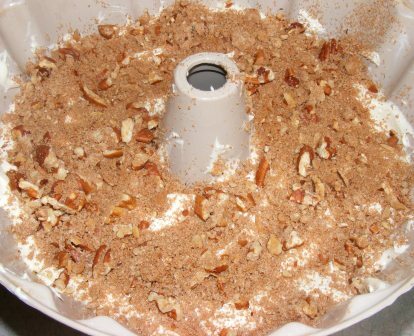 I topped the batter with half of the cinnamon-sugar-nut mixture. 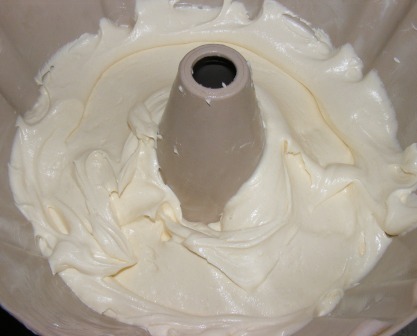 Then I spread the rest of the batter on top. Finally, I added the rest of the topping. I baked the cake at 325°F for about an hour, until it was golden brown and baked through. I read and reread the instructions for removing the cake from the pan and kept thinking they had to be wrong. If I followed the instructions — which said to invert the pan on a rack, lift off the pan, then put a rack on top of the cake and invert it again — the cake would wind up upside down. 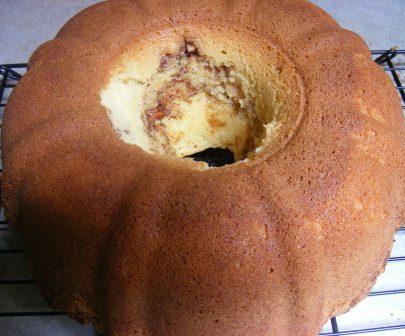 But when I turned the cake out of the pan, I realized that “upside down” was right side up for this cake, since the cinnamon-sugar-nut mixture was on top of the cake in the pan. You’d think I would know by now to trust Nick’s instructions. 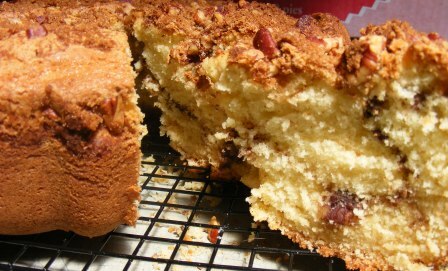 This was a wonderful coffee cake. The cake itself wasn’t overly sweet. The sour cream added both richness and a bit of tang to the crumb. 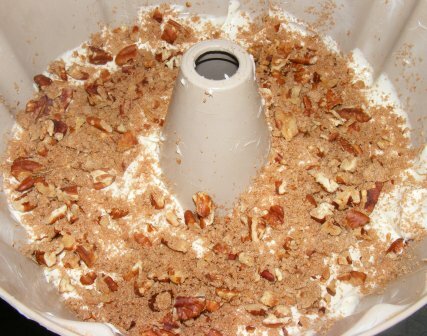 The nut mixture was, of course, quite sweet, but it was distributed throughout the cake in such a way that it blended perfectly with the cake. 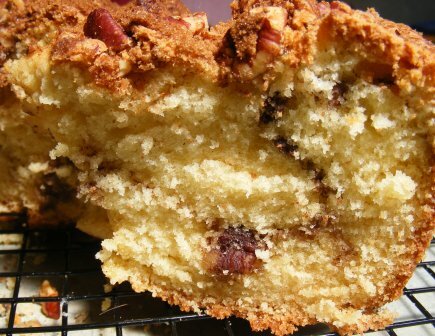 This is definitely the recipe I will reach for the next time I want to make coffee cake. 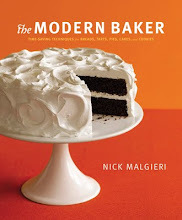 And it’s just another reason I’m glad to have my well-worn copy of The Modern Baker on my cookbook shelf. Mine resides mostly in the kitchen and on the floor by my chair. Wow, that looks great…I am totally confused about right side up upside down inside out wrong side showing….so I will just go with “nuts end up on the top.” LOL. Great recommendation. MY MB book is forever on the counter as well…and orange does not go with my decor but it’s there anyway. Nice process photos. I’m sure I made it more confusing that it had to be. “Nuts on top” works! Nuts on top or bottom…good either way!